Agency creates web film to hire a "badass creative director"
CANNES — Taking a new route to recruiting, 180LA slipped an ad for a creative director in front of Cannes Lions jury members by entering it as an award. The Omnicom agency, based in Santa Monica, entered the ad into the film, direct, radio and press categories. The case study film entered into the direct category begins by explaining how 180LA is looking to hire a "badass creative director" and even calls out some jury members, including Luca (Lorenzini, Saatchi & Saatchi Japan), Erick (Rosa, Lowe & Partners South Africa) and Eva (Santos, Proximity, Spain). Most Direct Recruitment Ad from theawardsubmission on Vimeo. 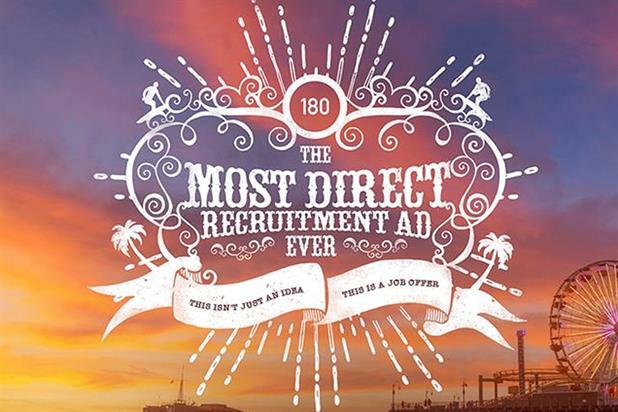 Asserting that if you are on the Cannes Lions jury, "you're definitely one of the best creative directors in the world," it sells the job opening as a chance to work in one of the "sexiest agencies in the world." The film provides an address for potential applicants to contact the agency and requests that — even if they’re not interested — jury members pass the ad onto the shortlist for other creative directors to see. Some Cannes Lions jury members have commented about the recruitment campaign on Twitter, including Santos, who said: "A case study just called me by name and offered me a job. Great idea @180LA #canneslion #lionsjudging."